Little Letters Alphabet – learn your ABCs in 1, 2, 3! This well-rounded educational game, geared at the 2-5 age group, includes three different alphabet-based games. Accompanied by bright colors and engaging animations, tots will love learning their ABCs through this app. With a focus on familiarizing children with the alphabet by practicing writing and recognizing letters, and learning how to use those letters to form words, this is a fantastic educational tool that can be used either to introduce toddlers to the alphabet, or to supplement classroom learning. 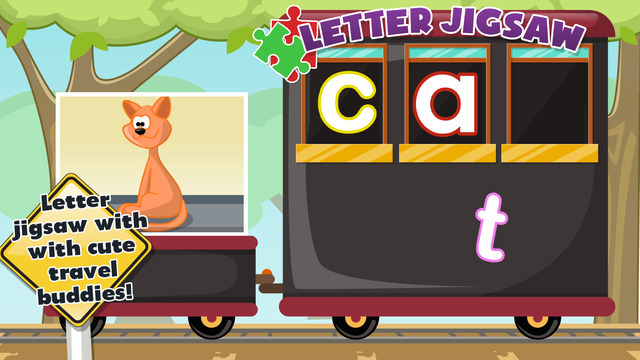 In this game, children learn how to properly write letters by tracing over them. An animation demonstrates how to write each letter step by step, and is accompanied by a narrative that lets them hear the letter. The children follow along by tracing the given outlined letter, which gets them comfortable with the writing process, and also teaches them how to properly write each letter. This portion focuses on letter recognition. Kids will be shown the letter “B” and then be encouraged to find it in a group of five different letters. Verbal direction and positive feedback are also included, so kids can hear the pronunciation of the letter (“Find the letter B!”) along with its image. Particularly great for toddlers and preschoolers, this focuses on word association, vocabulary, and spelling. An image (for example, the sun) will appear on the screen, along with jumbled up letters. The goal is to take the letters and rearrange them to spell out the word that the picture represents. Paired with the included narrative (“Solve the word ‘sun’”), kids can see both the picture and the letters that make up the word, and hear how the word is pronounced. Let them sound it out as they figure out which letter goes where! Each game utilizes various skills, such as hand-eye coordination, word association, letter recognition, and listening. By hearing the letters and words that they are seeing on the screen through the accompanying narrative, toddlers and preschoolers can learn about the correlation between letters, words, and sounds. Knowing their ABCs and being comfortable with writing will give children an extra boost of confidence both in and out of the classroom. Don’t hesitate to download this app today!